We spent two weeks in Rajasthan from Dec. 26th - Jan. 9th. 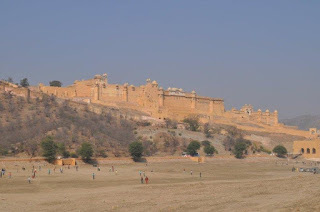 We visited Jaipur, Jodhpur, Jaisalmer and Udaipur. Weather-wise this is a good time to go as it is "winter." It is warm in the day, t-shirt weather, and a little cooler in the evening, requiring a sweater or shawl. The drawback of course is all the tourists, Indian and Western. We aren't used to seeing many tourists in Bangalore so it was a bit of a shock to see so many - and worse, to feel like one. Flew into Jaipur at 11:00pm and got a prepaid taxi to Naila Bagh Palace (our hotel). Within ten minutes driving along the street we saw a camel and an elephant walking alongside the road. Arrived at the hotel and went straight to the room. Don't be fooled by the term "palace." This place was the palace home to the Rajput family in the 1800's and apparently they decided to keep the original dust from back then too. The place has character and nice grounds. It has potential if they would clean and maintain it. As it is, it is overpriced and we weren't happy with the room or the minimal breakfast. Once we got over that we hired a taxi for the next day at 1000 Rp ($22Can) and visited the Amber Palace. 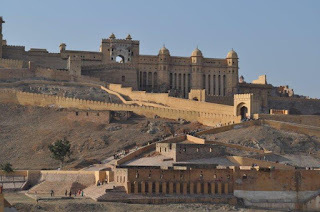 The Palace is situated on a hill 20-30 minutes outside Jaipur. Normally one can take an elephant up the ramparts to Amber but there are so many tourists at Christmas that they can't accommodate the workload. So we hiked up the ramparts and up the steep steps to the palace. Amber is much larger than I thought it would be. It is a beautiful building of sandstone and marble arches. There are rooms full of incredible glass inlay, delicate marble carvings and paintings. So many rooms to see and the audio guide was interesting - all in all we were there about three hours. On the way back into town we stopped at the lake for a view of the Lake Palace at sunset. Very pretty with a big walkway along the lake with foodstalls and lots of people milling about. Took the kids back to the room and Michael and I went out for a walk. The local people are extremely friendly and love it when I take their photo. In fact, when they see my camera they often ask me to take their photo. Grabbed some samosas off a street vendor and called it a night.